You are at:Home»Opinion»So how successful was Farnborough International Airshow 2018? 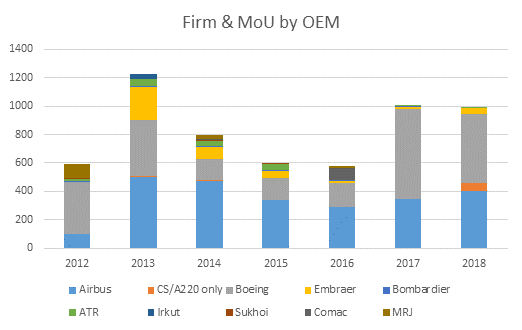 Global consulting firm IBA predicted 908 firm/MoU orders prior to the 2018 Farnborough Airshow, and looking at the headline numbers, a total of 996 firm/MoU orders were announced (adjusted for ones already previously announced), only nine fewer than last year at Paris Airshow. A strong push on Letters of Intent (222) and options pushed the total number to 1,364, a number that hasn’t been surpassed since the Paris 2013 show. As the chart below indicates, the trend of oil price and airshow orders broadly continues. However the mix within the different sectors is disordered. 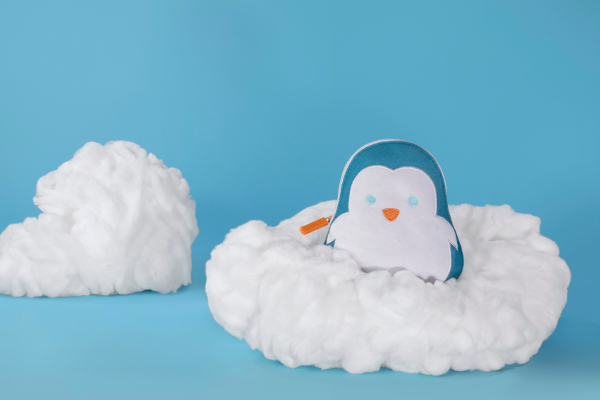 According to Dr Stuart Hatcher, COO at IBA, one of the first visible changes that the firm continues to see is that the number of actual firm orders only, continues to remain very low. “This has been a constant trend over the previous four years, whilst commitments continue to grow. It may not be surprising when we consider the overall backlog has been steadily growing and we had tipped 15,600 for firm orders back at the start of June. Book-to-bill ratios have been so high in general that orders have generally been surpassing deliveries on average by 1,126 units since 2012”. As IBA explores this further it notes that another key aspect of the airshows every year is the release of the OEM forecasts. Looking back 15-20 years, these have been fairly conservative on narrow-body market growth. Unsurprisingly this year more conservative estimates were announced on the annual traffic growth rate for the industry, which still does not appear to be coming down from the +6% levels that have been witnessed since early 2013. In terms of orders Boeing surpassed Airbus by a narrow margin. The result for Boeing would have been higher if IBA counted the orders already previously announced – such as jet Airways’ 75 or Jackson Square’s 30. The orderbook for Boeing was filled with MAX commitments with a few 787s and 777-300ERs as predicted. A welcome appearance of freighter orders shows that Boeing remains the leader in the widebody freighter sector. 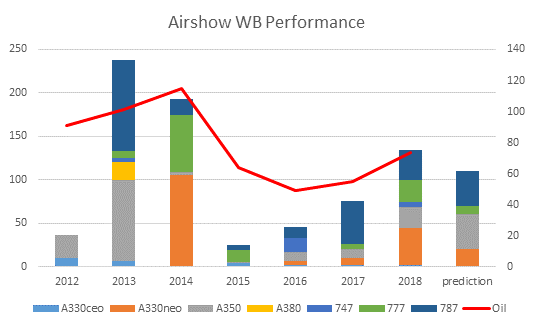 From Airbus, A320neos, A330neos and A350s (including some 1000s) comprised the airshow order book and around 30% of the narrowbody sector was taken by the A321neo, whilst the MAX 10 only garnered <19% of the MAX backlog from the identifiable ones. 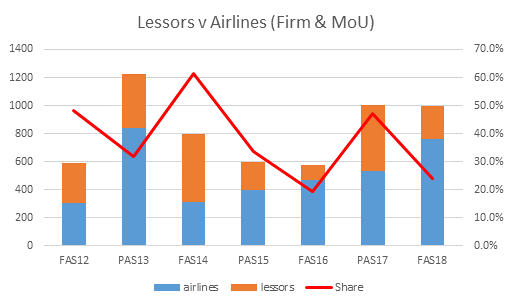 In terms of order spread amongst the sectors, there weren’t many surprises this year, with narrow-bodies taking 814 firm/MoU orders (81.7%) at the show, and widebodies getting a small uptick at 134 (13.5%). 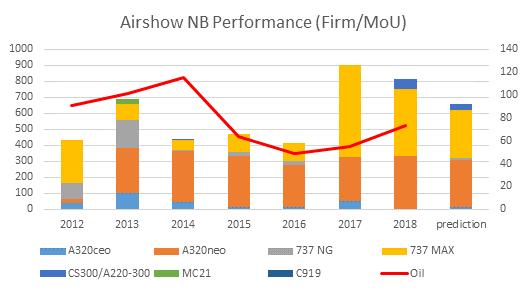 When IBA looks specifically at narrowbody order performance at the 2018 Farnborough show, the neos and MAXs dominate with 330 and 424 respectively, with the added bonus of the newly branded A220-300. According to IBA the regional market has taken a positive shift with a total of 217 regional aircraft commitments received, comprising firm orders, MoUs and LoIs. If Options are included, this number rises to 342 aircraft. Of these total commitments, the vast majority are for regional jets, which accounted for around 17% of the total firm orders, MoUs and LoIs received during the four days of the show. 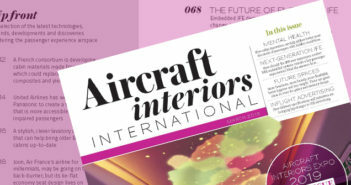 IBA considers there has been pent-up demand for regional aircraft, particularly over the past 12 months, as potential customers have waited to see how Airbus and the CSeries, and a Boeing/Embraer connection would play out. The recent announcement that Boeing will take control of Embraer’s commercial aircraft division has been met with a wave of demand for new Embraer aircraft at Farnborough 2018. 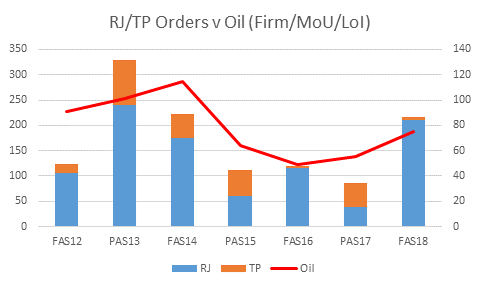 The following IBA.iQ chart shows the recent trend in regional aircraft orders against oil price, which has been adjusted to include LoIs. Of the few turboprop orders placed, MoUs were signed for seven aircraft by two customers: Hokkaido Air System (Japan) and EasyFly (Columbia). A number of commitments were made on the previous Friday (13th July). These totalled 10 aircraft, all of which were ATRs. No Bombardier DHC8 turboprop aircraft were ordered during or around the Airshow. None of these are recorded as firm orders. “In contrast, regional jets accounted for 41 firm orders (+ 10 options) and 169 LoIs (+ 114 options) at the show this year. No MoUs were signed for regional jet aircraft”, states Hatcher. “Leading up to the show, much of the news focused on the regional market. In sharp succession we have seen Airbus enter the regional aircraft space with its acquisition of a majority share in what was the Bombardier CSeries program. Embraer has now announced a tie-up which would give Boeing control over its commercial aircraft business. Embraer’s commercial aircraft programs will be rolled into a joint venture, in which Boeing would have an 80% stake. The deal is expected to close late next year, subsequent to the necessary regulatory approvals. Bombardier retains a foothold in the regional space and a firm order was received from Uganda Airlines for four CRJ900s. No examples of the smaller Airbus A220-100 aircraft were ordered during Farnborough. Although Embraer dominated the regional market, IBA.iQ records that an LoI was signed by Peruvian Airlines for 10 Sukhoi SuperJet SSJ100-95 aircraft. Meanwhile, Chinese carrier Urumqi Airlines signed an LoI with Chinese OEM, COMAC, for 20 ARJ-21 regional aircraft. 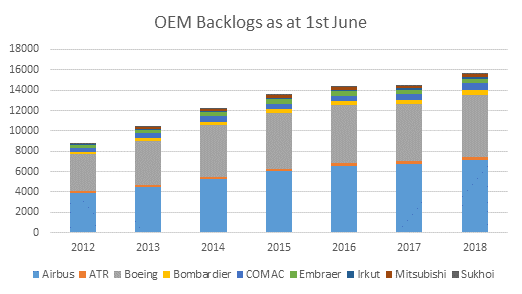 So, what do the regional OEM backlogs look like? 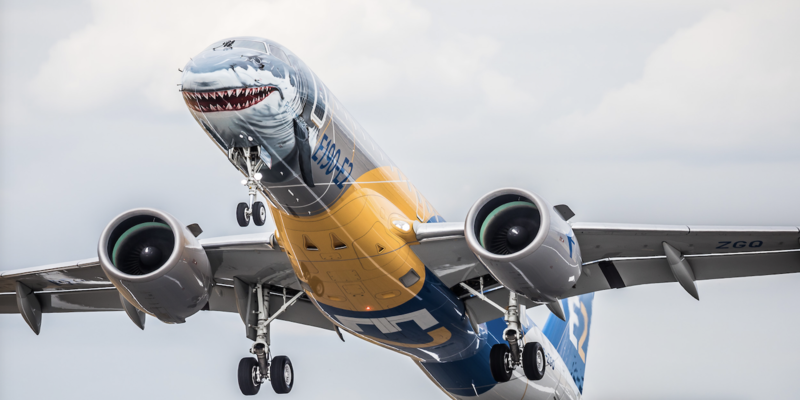 IBA’s analysis indicates that Embraer finishes Farnborough week in a strong position, with a current backlog of almost 500 aircraft to deliver across all of its aircraft models. COMAC has the second-largest current backlog, although its order book is concentrated almost exclusively in its home market, China. Despite a relatively small number of commitments compared to previous years, ATR maintains a healthy backlog of over 250 aircraft, or around three years’ production at the current rate. Mitsubishi Aircraft Corporation (MITAC) showcased its MRJ 90 regional aircraft at the show, and despite some delays to the program, the Japanese OEM still holds the fourth-largest regional aircraft backlog. 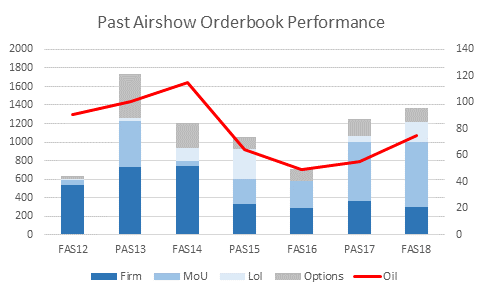 In summary of the show itself, whilst some analysts were indicating that this would be ~500 firm order/MoU year, IBA correctly identified that this would be a strong show, with close estimations of widebody and narrow-body performance – and the year has a long way to go. Based on trends in recent years, December will also likely be a strong month for orders as both large OEMs hunt for 2018 sales. IBA was established in 1988 to provide independent expert business analysis to the aviation industry. IBA advises commercial and business aviation clients, aircraft/engine manufacturers and operators. Services include asset valuations, technical and engine management, advisory, consulting and commercial services, industry and sector research and analysis. The full Farnborough Airshow Report 2018 on IBA’s website.